Speculative Romance Author Regina Paul: Flash Fiction Friday: Angel Trapped in Stone 404 ~ Page Not Found! Adrianna seethed, every time she awoke still frozen in the uncomfortable position her temper flared. If she ever got her hands on her ex-lover he was going to die a slow and painful death. Leave it to her to fall in love with someone who was practicing the dark arts. Her sister had tried to warn her, but had she listened no, she had not. He'd been so handsome, and so devoted to her, or so she'd thought. But she'd been wrong, terribly wrong. While she and others like her had to be careful not to show their true talents, she had thought Donald understood. After all he was "different" too. 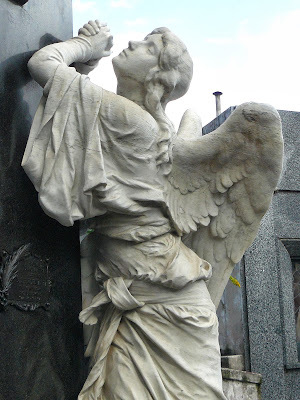 Unfortunately, by the time she realized it, her sister Drusilla was dead and she was trapped inside the body of a stone angel, her sister's monument. She watched silently for decades while first her niece and then her great-niece had aged and become old women. Her great-niece hadn't had any children so when she stopped coming, Adrianna could only assume the old woman had died. Adrianna was relatively certain that over a hundred years had passed. It had been 1888 when Donald had trapped her in stone above her sister's grave. If the strange inventions, the carriages without horses, and the fact that women wore skirts that showed more than her undergarments had back in 1888 were any indication, it had been a very long time. The anger drained out of her. She knew she would only be conscious for a short period of time before the stone would pull her back into some sort of magical sleep. Donald's doing no doubt. The strange thing though, she usually never awoke unless someone was coming to visit her sister's grave. But who could it be? Her great-niece had stopped coming and she'd only been awakened with the occasional visitor to another grave after that. She had no idea how much time had passed since her great-niece had stopped coming. Resigned to the fact that she would only be awake a short time, she took stock of her surroundings. Strangely she could see all around her though she was held immobile within the stone angel. It didn't hurt exactly, though it was uncomfortable in a strange sort of way. Occasionally she thought she felt a fleeting muscle cramp, but then it would be gone. Suddenly a man came into view. He was different than anyone she'd ever seen before. Even his mode of dress and transportation was different. Unlike her great-niece who had driven up in one of those horseless carriages, this man appeared out of thin air. His clothing was scandalous, at least for her era. It molded to his body as though a part of his skin and was a lovely blue color. The material was unlike any she'd ever seen before. His shoes looked a bit like the ones her niece wore though with that strange symbol on the side that looked a bit like hook, but smoother. Once when her great-niece had turned to walk away she'd gotten a look at the word on the back, Nike. What in the blue blazes was a Nike? This man's shoes had the same symbol though. Strange. The man was very handsome, tall, well over a foot taller than her five feet, with spiky blonde hair and beautiful forest green eyes. He had a square jaw and high prominent cheek bones perhaps hinting at some American Indian blood, though in her day no one would have voluntarily admitted such. Instead of going to one of the other graves as she had thought he would, he walked directly to her sister's and stood in front of it looking up at the stone angel or her rather. "Have I finally found you my beautiful Adrianna?" He whispered. Shock rolled through Adrianna. How did this stranger know her name or know she had been trapped in stone all these long years? How was this possible? "I hope I've finally found you, my love." He whispered before reaching into what appeared to be a pocket and withdrawing a small glass vial with an even smaller cork stopper. Why was he speaking to her as if he had known her his whole life? She had never seen this man before, though there was something about him that tickled her memory, something familiar though she knew not what. As her mind struggled with that question, the man pulled the cork stopper and poured the vile of liquid onto the stone encasing her. Wait! Was she able to move her finger? Adrianna tried to move another finger and found she could shift it ever so slightly. Was she finally going to be freed? "Can you move, Adrianna?" The man seemed to be looking for some sign, but she had no way to signal to him that she had movment, small though it may be. Inside she screamed, "Yes, yes! Keep doing whatever you're doing, get me out of here!" The man's eyebrows rose in surprise almost as though he could hear her, and he stared up into her face. Oh, if only she could smile, wink, wiggle her nose something! Anything to let him know that whatever he was doing was working. A determined look came over his face and he began chanting in latin. It was a language Adrianna was well aquainted with having used it to write spells since the time she'd begun learning the Craft at her grandmother's knee. Suddenly pain the likes of which had only felt one other time, the time when Donald had used the dark spell to encase her body and soul in stone, after he'd murdered her sister. Suddenly there was a great loud cracking sound and she was falling. Instead of hitting the hard ground as she'd expected, strong arms caught her and held on tight. Adrianna carefully opened her eyes, almost afraid to believe that she was finally free. The pale skin of her own hands and arms greeted her vision and she felt tears gather in her eyes. "Finally!" She gasped, hearing her own voice for the first time in longer than she could remember. "Yes, finally, I've finally found you my Adrianna." Adrianna lifted her head. Why was the man being so familiar with her? She knew she didn't know him. Who was he? How had he known she was trapped inside the stone angel? "Who are you?" She lifted her eyes to gaze into the man's face when the reason he looked familiar hit her with the force of a tsunami. "Donald!" She hissed, her fingers curving into claws ready to scratch his eyes out. Instead of being frightened by her sudden snarl and glare, the man simply curved one large hand over hers and said, "No Adrianna, I am not Donald, I am not the man who trapped you in stone." Adrianna tried to wrench herself out of his arms, but her struggles were for naught, for the man was much stronger than she was. "Stop it Adrianna!" He commanded in a firm voice. "I know I have his eyes, but I am not my great-gereat Grandfather. I don't now nor have I ever practiced the dark arts. Your own senses should tell you that." Adrianna reeled at the rebuke. Donald's great-great grandson. How was this possible? That would mean that even more time had passed than she originally thought. She would have to be careful, this could be a trap, a trick. As though he'd read her mind, the man said, "It's not a trap Adrianna. My family has been searching for you for the last three generations. My great-great grandfather kept a journal. In it was every dirty deed and evil thing he had done. Every dark spell he'd ever created. The only reason we kept the journal was because we knew it was our only hope to find you." The fight went out of Adrianna. While it was true that Donald had been a dark practitioner, now that she was no longer trapped in stone, her senses were telling her that this man was a practitioner connected to the light, as was she. "Who are you?" She whispered, still staring at the pale skin of her hands, and the white cotton material of the underclothes that were the only thing she'd been wearing when Donald had cursed her. "My name is Ryan." He lifted her chin with one finger, forcing Adrianna to look into familiar eyes. However, unlike Donald's eyes, this Ryan's were clear and the white lightning arcing in them proclaimed him a son of the Goddess. "I was raised to continue the search for you. I and my cousins. You see Donald married another white witch. Like you, he hid from her what and who he truly was and was aligned with. They had one son named Gregory, my great-grandfather. When Gregory was ten years old, he stumbled on his father and his mother in the wine cellar. His father had used a spell to trap his mother within a circle and was torturing her by slowly draining her magic. He found out with his mother's dying breath that his father had been doing this for years. The only reason she'd stayed was because he'd said if she didn't he would do the same thing to their son." "That's what he had planned for me." Adrianna whispered, horrified. "Yes, but your instincts were better, you figured it out before he could marry you and you tried to fight him. That's when he trapped and murdered your sister and then entrapped you in the stone angel." "Why did it take so long for someone to find me?" "Donald boasted of the spell in his journal, even wrote the spell and ritual down that he'd used, but he hid the location of your entrapment in a riddle. No one could figure it out. The riddle was in gaelic runes which made things that much harder. See, Gregory killed his father trying to protect his mother. He was too late to save her, but he was only ten years old. His training was not complete. He was raised by his mother's sister and her husband. This is who he received his training from. He didn't find his father's diary until many years later and by then his memories were sketchy at best. And since he didn't practice the dark arts, and his father had been too greedy of the knowledge to bring him into his confidence, Gregory could only use the knowledge he'd been given by his mother's family. It wasn't enough." He ended. "How did you find me?" "I found Donald's Book of Shadows. The translation of the riddle was inside. Even with that though, it was hard to find you. Earth's population has quadrupled since your time and this cemetery is set to be removed and relocated next month. It was the last one. If I hadn't found you here, there was no way any of us would ever have been able to find you." Ryan stroked back Adrianna's inky black hair. "You're as beautiful as he said you were, as you look in the drawings he did of you." He whispered. Mesmerized by his deep green eyes, Adrianna was momentarily diverted by the word, "Drawings?" "Yes, Donald was obsessed. He drew you in every conceivable position and state of dress." Ryan's lips were closer to hers and Adrianna felt her body flush. "Every state of dress?" She whispered the words against warm lips. "Every state of dress." He confirmed. "Oh, dear." Heat flowed through her body. Ryan smiled against her lips. "But her safe now." He said. "Safe in my arms, and I'm never letting you go now that I've found you." And so she was, forever more. (c) Copyright 2013 by Regina Paul. All Rights Reserved. Sign up for Regina's Universe and Get a Free Story! Photos that I used to create this website are from Can Stock Photo. All other photos are from RGB Stock, Free Images or are in the public domain. Images in guest posts are the property of the author, or publisher respectively. Autbor Spotlight on Laura Tolomei! 5 Stars from Joyfully Reviewed for Alien Deceptions! Eye Candy Thursday: Ooohhhh La La!